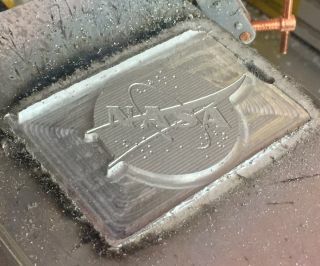 NASA's logo, made in aluminum by Made In Space's Vulcan manufacturing system during testing and development. Made In Space just took another step toward constructing big, complex structures off Earth. The California-based company, which built the two 3D printers aboard the International Space Station (ISS), just secured a NASA contract to continue developing its next-generation Vulcan manufacturing system. "The Vulcan hybrid manufacturing system allows for flexible augmentation and creation of metallic components on demand with high precision," Mike Snyder, Made In Space chief engineer and principal investigator, said in a statement. "Vulcan is an efficient, safe capability that utilizes the minimum amount of resources during manufacturing processes." The new contract is a Phase 2 Small Business Innovation Research (SBIR) award. Made In Space recently completed the work laid out under the company's Phase 1 SBIR contract for Vulcan, which Made In Space received last year. When Vulcan is ready to go, Made In Space aims to demonstrate the technology on the ISS, showing Vulcan's potential usefulness for a variety of exploration missions. "Vulcan can be important to logistical reduction necessary for long-term exploration," Snyder said. "The hybrid manufacturing system is a major step forward for efficient space operations, providing the ability to build essential components and assemblies in the space environment, where flying spare parts from Earth is otherwise not viable." Vulcan will be able to use more than 30 materials as feedstocks, including titanium, stainless steel, aluminum and a variety of plastic composites, Made In Space representatives said. The upgradeable system will employ 3D printing as well as standard "subtractive" techniques to machine the printed parts down to their final shapes. This will all be done robotically. Made In Space is also working to develop other technologies and systems. For example, the company recently launched to the ISS a machine that makes a high-value optical fiber called ZBLAN, which is tough to make here on Earth. (Our planet's gravity induces tiny defects in the fiber.) The goal is to determine whether manufacturing ZBLAN in microgravity is viable and lucrative enough to merit doing so on a large scale. If so, Made In Space plans to ramp up production of the stuff and bring lots of it down to Earth for sale. Made In Space retains ownership of one of the 3D printers on the ISS, operating the machine as a commercial facility. The other 3D printer now belongs to NASA.